with 100mm width perforation, 100mm x 200mm sheet size easy cutting, Easily cut 100 mm x 200 mm size, machine holes every 100mm width. Pop up sheets that can be matched with work use. No clogging like in sandpaper. Does not tear like steel wool, so can product a uniform finish that can last a long time. Skinning before application of paint. Now a necessities of car painters. In our case, it is saved because it can be purchased cheaper than the local contractor. This review is about item#2297407. Ease of use, I am satisfied with the finish of the work. I always have it in my work area. I use it at the time of painting. I bought it cheaply and it was saved. This review is about item#2297416. I can polish it well. It will be more helpful if it will last longer. This review is about item#02297407. There is no dissatisfaction, but if you have twice the thickness now, it is easier to use. Wood products We are using for urethane paint coating film polishing. You can polish the surface comfortably like curved surfaces and details. I would like to use it in the future. I am very satisfied. Because the price is low price which is not elsewhere, I am repeating. Local paint shop was slightly cheap, but because there was no stock, the next day I ordered to arrive at MonotaRO Co., Ltd.
After washing the stainless copper product with sulfuric acid, scrape with this product to remove the oxide film. The main purpose is to rub copper plate and brass products washed with sulfuric acid, but the only regret is that this product is vulnerable to acid. However, although it is a disposable expendable item that is immediately worn or rubbed at any rate, it is no problem. 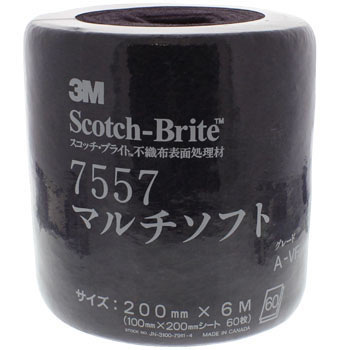 It's a highly reliable 3M product, so it's a price match (with other stores). This review is about item#02297416. I would appreciate it if you would handle such items with a monotail, and the price will be saved cheaply.